Have you read these books? 18 Books from my 2016 stack. | Redux & Co.
Have you read these books? 18 Books from my 2016 stack. Drink more water, read more books. Those were two of my [many] goals for 2016. I can’t help you with the first one (yet). But here’s a pile of books (more than I expected!) that nourished me over 2016 that you might enjoy. Have you read these? What did you think? 1. Higher Calling by Adam Makos. This story unfolds in the battle-filled skies of Germany during WWII. 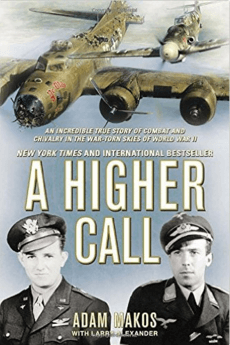 about an encounter between a heavily shot-up U.S. bomber with injured crew and a Luftwaffe fighter pilot who has them in his cross hairs. If ever there was a time to think more deeply about how divisions can portray a monolithic brush about the other side, here’s a glimpse of humanity. We get up and personal with the pilots of each plane to understand their motivations and perspectives of the war. 2. And I’m currently reading, Wright Brothers I knew next to nothing about the history of the Wright brothers and their road to inventing the plane. 3. Boys in the Boat by Daniel James Brown. The narrative of this book is exquisite as it shows the boys preparation leading up to the Olympics and at the same time unfolds the orchestration and propaganda machine of the Third Reich for the world stage as a civilized and modern government. 4. Hunting Eichmann – How a Band of Survivors and a Young Spy Agency Chased Down the World’s Most Notorious Nazi by Neal Bascomb. I devoured this book during our sojourn to Israel earlier this fall. 5. Pirate Hunters by Robert Kurson. Epic, swashbuckling adventure into how some divers hunted the pirate ship of the infamous and notorious pirates who made Blackbeard and Kidd look like boy scouts. Here’s how these divers tracked the priate ship called Golden Fleece. While I’m at it, I just have to give a shout out so you know this book is a follow up to Kurson’s book Shadow Divers, which I found at a thrift shop while in Florida for a 2014 decompression session. I tore through the book in a few days, and it was one of those books where I was sad when I reached the end because I wanted it to keep going. Real life is truly stranger than fiction, and this story follows two divers who discover a lost WWII German U-boat off the coast of NEW JERSEY. It’s a fascinating multi-layered look at the risky deep dive adventurers who risk their life to discover uncharted wrecks. And in parallel, a deep dive into the WWII history behind fearsome Nazi U-boats, and how the Allies learned to hunt them and the sinking of this specific crew. 6. People of the Book by Geraldine Brooks. Lush book with an elegant thread woven through history following a book and an investigator seeking to learn about the secrets hidden within its pages. 8. Essentialism The Disciplined pursuit of less by Greg McKeown. 9. Living Forward – Avoid the drift by Michael Hyatt. I’ve never been a 5-year plan kind of guy let alone, next week kind of guy. But between the Redux project and Project Be-a-Good-Husband-Dad-Human has me desiring to more intentionally calibrate my life and direction thoughtfully. Along with my daily Calibration Journal that I’ve mentioned before, I definitely find deep value in time set apart to reflect and meditate. 10. The Life-Changing Magic of Tidying Up: The Japanese Art of Decluttering and Organizing by Marie Kondo. I like reading books concurrently with Grace whenever we can find overlap. I aspire to keeping our home minimal, or at least lean. Clutter makes me feel restless and hinders my focus. Still, I was skeptical about how useful this little book would be when I picked up. There’s definitely some weird hokey parts such as thanking your stuff before you toss it, but there’s something to a grateful attitude even when purging stuff. I never thought I’d change the way I rolled my clothes, but after folding a few items the Kondo way I instantly saw how a minor change could transform my pile of t-shirts into quickly scannable rows. Small intelligent change that done correctly can also help reduce decision fatigue. 11. The Book of Job by Unknown author. During my journeys in Scripture this year, Job’s disaster and aftermath struck me afresh. Job is a righteous, and good man. He loses children, business, and health. When the disaster strikes, his well-meaning friends intone with words that sound correct. However, in the end they’re totally off base with their “advice” and admonitions. Reading Job is sometimes like trying to navigate my own thoughts and questions. “Wait, who is talking here? Is this the right way to think about the problem? Do I really know who God is?” I’m reminded to hear from the Lord personally before others — even ourselves — no matter how things appear. And this is especially true when we must wrangle with the purpose and meaning of suffering. 12. Deeper Lives of Famous Christians by J. Gilchrest Lawson. I know, I know. The “Famous Christian” part is kind of off-putting even to some Christian friends who’ve seen the book. Let me explain: Gilchrest selected 20 Christians who deeply influenced the society and culture when they lived. This is not to say that “less famous” or less influential Christians don’t have deeper lives, it’s just one lens by which to explore how God has met, moved, and mobilized men throughout history. 13. Japan Talks by Norman Grubb. Another one with a less than stellar title — it’s pure function, as this little book is a collection of talks that Grubb spoke to a group of missionaries in Japan about what it means to abandon our lives to Christ. Tons of great nuggets of truth held up to the light. One of my favorite parts is when Grubb blasts one of the attendees for taking a flash-photo of him during the talk. Hilarious that the editors left that in. 14. E-Myth Why Most Businesses Don’t Work and What to Do About It by Michael Gerber. Work on your business not in your business. Systems thinking and how to think more effectively about building a sustainable enterprise. 16. Brand Hijack by Alex Wipperfurth. Can I let you in on a little secret? I don’t like running ads. I don’t like running “sales.” I don’t like blasting people with emails about Black Friday, and whatever-excuse-we-can-find to assault people. I don’t react well to that, and it’s just not me. But now that we’re in e-commerce mode, you all know how saturated the watch and gear market is. Somehow we need to be out there in the conversation. Right now, we run Facebook ad campaigns because we must. Because although it may not seem like it, we do have some overhead to maintain operations and inventory and ongoing expenses. But I try my best to keep them tasteful, interesting, and hopefully educational on some level. 17. Anything You Want by Derek Sivers. This is a concise little book that’s filled with nuggets of wisdom gleaned from Sivers’s wisdom learned from building CD baby. 18. Power of Habit by Charles Duhigg. We all know habits shape who we are. Duhigg, a journalists inspects the scientific literature and adds stories to illumine the mechanics of how habits are formed, and more importantly, how we can re-calibrate old habits and/or start new habits. What books do you recommend from your stack this year? This entry was posted by pilot in Life Skills and tagged books. ← 12 Developments from HQ and what’s next.